The Colts have a "bullish stance" on Mack (hip) as a featured running back, Kevin Bowen of 1070 The Fan Indianapolis reports. Mack (hip) topped the 100-yard rushing mark four times in 12 contests in 2018, finishing with 195 carries for 908 yards and nine scores. He also added 17 receptions for 103 yards and another touchdown. Mack won't return to Saturday's divisional-round game at Kansas City due to a hip injury, Andrew Walker of the Colts' official site reports. Analysis: The Colts rarely committed to the ground game after falling behind early, limiting Mack to nine carries for 46 yards. He'll enter the offseason as he did the regular season -- with an injury in tow. Expect the team to go into more detail about Mack's health in the aftermath of a likely loss. Mack rushed 24 times for 148 yards and one touchdown while catching two of three targets for six yards in Saturday's playoff win over the Texans. Mack rushed 25 times for 119 yards and a touchdown in Sunday's 33-17 win over Tennessee. 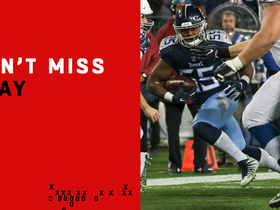 He lost a yard on three receptions (three targets). Mack rushed 12 times for 34 yards and touchdown while catching one of three targets for four yards in Sunday's 28-27 win over the Giants. Analysis: This had to qualify as a disappointment for Mack coming off a career-high rushing effort the week prior against Dallas. Unfortunately, it seems like the norm recently for the 22-year-old, who now has run for 34 yards or less in three of his last four games. With four scores in the last three weeks, however, he'll be a touchdown-dependent play on the road against the Titans' in Week 17. Mack carried 27 times for 139 yards and two touchdowns Sunday against the Cowboys. He also caught one pass for a 10-yard gain in the 23-0 win. Analysis: The Dallas defense had allowed just one 100-yard rusher this season coming in, but Mack gashed them repeatedly en route to a new career high in rushing. He scored a one-yard touchdown in the first quarter and added a six-yard score to start things off in the third. Mack was bottled up on the ground over the last two weeks, but he still has at least 96 scrimmage yards or a touchdown in four of his last five games. He'll hope to retain a sizable role in the offense Week 16 against the Giants. Mack rushed 14 times for 33 yards and a touchdown in Sunday's 24-21 win over Houston. Analysis: Mack had a tough day all around and was unable to catch his lone target. However, he got the Colts on the board with a 4-yard rush for a touchdown in the second quarter. After back-to-back 100-yard efforts with scores in Weeks 8 and 9, the South Florida product has surpassed 35 rushing yards just twice in five games since. He'll try to reverse that trend at home Week 15 against Dallas. Mack said Friday he's the healthiest he has been all season, Zak Keefer of The Indianapolis Star reports. Analysis: In addition to the hamstring injury that held him out for most of August and September, the second-year running back has dealt with a sprained ankle, an unspecified foot injury and a concussion. While it's promising to see Mack absent from the Week 14 injury report, he'll still have his hands full Sunday against a stingy Houston defense that surrenders just 3.7 yards per carry and 91.3 rushing yards per game for the season. It doesn't help that the Colts are road underdogs. Mack (concussion) rushed eight times for 27 yards and caught his lone target for six more yards in Sunday's 6-0 loss to Jacksonville. Analysis: Mack cleared the concussion protocol ahead of this one, but the Colts looked reluctant to give him a heavy workload, instead opting to let Andrew Luck throw the ball 52 times. Indianapolis' starting running back had mustered 85-plus rushing yards in four of his previous six games, so a bounce-back effort is possible against the streaking Texans in Week 14. Mack (concussion) is listed as active for Sunday's game against the Jaguars. Analysis: Mack is thus on track to head the Colts' backfield Sunday against a Jacksonville defense that got the best of him in Week 10, limiting the running back to 29 yards on 12 carries and nine yards on two catches in a 29-26 Indy win. He'll look to bounce back Sunday, with the Jaguars on a seven-game losing slide. Nyheim Hines and Jordan Wilkins are on hand to work in complementary roles for the Colts in Week 13 and would step in in the event that Mack suffers any injury setbacks Sunday. Mack (concussion), who is listed as questionable for Sunday's game against the Jaguars, is expected to play, Adam Schefter of ESPN reports. Analysis: Schefter's report doesn't indicate if Mack has cleared the final phase of the five-step concussion protocol, but the expectation is the running back will receive clearance from an independent neurologist prior to the 1 p.m. EST kickoff. Mack practiced Thursday and Friday in full capacity and should head the Indianapolis backfield if he is in fact cleared to play against the Jaguars' 16th-ranked run defense, which ceded 167 yards on the ground to the Bills in a Week 12 loss. Mack (concussion) is listed as questionable for Sunday's game against the Jaguars. Coach Frank Reich said Mack still has one more step to clear in the NFL's concussion protocol before receiving the green light to play in Sunday's game against the Jaguars, Mike Wells of ESPN.com reports. Mack (concussion) took part in Friday's practice, Kevin Bowen of 1070 The Fan Indianapolis reports. Analysis: Mack was able to log a full practice Thursday and is getting some work in again Friday, suggesting he's endured no setbacks in his recovery from the concussion. He still has yet to clear the NFL's protocol for head injuries, but the door remains open for him to play Week 13 in Jacksonville. The Colts will reveal Mack's official status for the weekend shortly after practice concludes. Mack (concussion) was listed as a full participant in Thursday's practice, Andrew Walker of the Colts' official site reports. Mack (concussion) returned to practice Thursday, Kevin Bowen of 1070 The Fan Indianapolis reports. Analysis: That's a step in the right direction for Mack, though it remains to be seen how the Colts list his participation level or where he's at as of Thursday in terms of the NFL's concussion protocol. Mack (concussion) didn't practice Wednesday, putting his availability for Sunday's game in Jacksonville in serious question, Kevin Bowen of 1070 The Fan Indianapolis reports. Analysis: The nature of the NFL's concussion protocol makes it difficult for a player to gain clearance by Sunday without logging some level of participation early in the week. Mack thus needs to practice in at least a limited capacity Thursday or Friday to have any realistic shot at avoiding a Week 13 absence. The Colts likely are preparing for Sunday's game under the assumption Nyheim Hines and Jordan Wilkins will handle most of the backfield work. Coach Frank Reich said Wednesday that Mack remains in the NFL's concussion protocol, Andrew Walker of the Colts' official site reports. 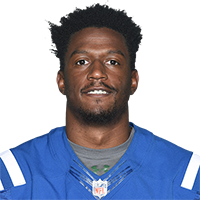 Mack (concussion) may not be available to play in Sunday's game against the Jaguars, Mike Chappell of Fox 59 News Indianapolis reports. Mack (concussion) has been ruled out for the rest of Sunday's game against the Dolphins, Joel A. Erickson of The Indianapolis Star reports. Analysis: Mack was able to walk off the field after taking a big hit midway through the fourth quarter, but subsequent tests confirmed initial fears of a concussion. He finishes the afternoon with 15 carries for 85 yards and two catches for 11 yards, leaving Nyheim Hines and Jordan Wilkins to man the Indianapolis backfield in the closing minutes of the game. Mack will hope to return for a Week 13 game against the Jaguars on Sunday, Dec. 2. Mack was pulled from Sunday's game against Miami in the fourth quarter to be evaluated for a concussion, Zak Keefer of The Indianapolis Star reports. Analysis: Mack was removed after he took a big hit on a 1-yard loss, leaving Nyheim Hines to handle most of the backfield snaps during a game-tying drive. Mack gained 85 yards on 15 carries and 11 yards on two catches prior to his early exit. He won't be able to return if tests determine he did in fact suffer a concussion. Mack ran for 61 yards and a touchdown on 16 carries and added an 8-yard catch during Sunday's 38-10 win over the Titans. The Colts listed Mack's absence from Wednesday's practice as not injury-related. Mack (foot) wasn't spotted at the portion of Wednesday's practice open to the media, George Bremer of The Anderson Herald Bulletin reports. Mack carried 12 times for 29 yards and caught two passes for an additional nine yards during Sunday's 29-26 win over the Jaguars. Mack (foot) does not carry an injury designation for Sunday's game against the Jaguars after practicing fully Friday. Analysis: Since returning to action Week 6 following a hamstring issue, Mack has seen his workload and production increase in each of the Colts' three contests since then. This weekend, he'll look to build off his 25-carry/132-yard/two-TD effort against the Raiders in Week 8. 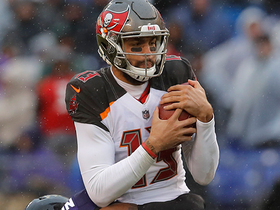 He'll do so while facing a Jacksonville squad that has dropped four straight games and is allowing an average of 123.3 yards on the ground to date. Mack (foot) remained limited at practice Thursday. Analysis: So far there's nothing to suggest that Mack's Week 10 availability is in any danger, but it remains to be seem if his practice limitations this week lead to a "questionable" designation for Sunday's game against the Jaguars or if the surging running back is removed from the Colts' injury report altogether come Friday. Mack was limited in practice Wednesday due to a foot issue. Analysis: Mack headed into Week 8 action with an ankle injury, but ended up having a big game (132 rushing yards, two touchdowns) in the Colts' win over the Raiders. He evidently came out of that contest a bit banged up and the Colts' bye week didn't completely fix that. That said, there's nothing so far to suggest that the running back's availability for Sunday's game against the Jaguars is in any peril. Another update on Mack's status will come when the Colts release their practice report for Thursday. Mack worked off to the side with the training staff during Monday's practice, Mike Chappell of Fox 59 News Indianapolis reports. Analysis: Mack dealt with an ankle injury ahead of a Week 8 win over the Raiders, but it didn't stop him from piling up 149 scrimmage yards and a pair of touchdowns. His limited practice availability coming out of a bye week suggests he's still a bit banged up, though probably not to the extent that would threaten his availability for Sunday's game against the Jaguars. We may not have another update until Wednesday when the Colts need to release their initial Week 10 injury report. Mack (ankle) rushed 25 times for 132 yards and two touchdowns while catching two of four targets for 17 yards in Sunday's 42-28 win over the Raiders. Analysis: Mack has played like a bona fide RB1 over the past two weeks, racking up 258 yards and three trips to the end zone on the ground along with another touchdown as a receiver. His two rushing scores in this one both came in the fourth quarter from four yards and one yard, respectively. Mack should earn lineup consideration in all formats following his Week 9 bye. As expected, Mack (ankle) is listed as active for Sunday's game against the Raiders. Mack (ankle), who is listed as questionable on the official injury report, will play in Sunday's game against the Raiders, Adam Schefter of ESPN reports. Analysis: Mack came out of the Oct. 21 win over the Bills with a sprained ankle, which limited his activity in practice Wednesday and led to him sitting out Thursday's session. He returned to full participation Friday and didn't suffer any apparent setbacks in that session, leaving the Colts optimistic he'll be ready to head their backfield in Week 8. While this report adds to the notion that he will play, double check that he is active before the 4:05 pm ET kickoff. Mack (ankle), who is listed as questionable for Sunday's game against the Raiders, has a "good shot" at playing this week, Ian Rapoport of NFL Network reports, citing a source. Mack (ankle) is listed as questionable for Sunday's game against the Raiders after practicing fully Friday. Mack (ankle) was spotted at Friday's practice, George Bremer of The Anderson Herald Bulletin reports. Analysis: Mack's availability for Week 8 appeared to be in peril when he sat out Thursday's practice, but his participation in Friday's session provides reason for optimism. He's not in the clear for Sunday's matchup with the Raiders just yet, though, and more should be known about his status when the Colts release their final injury report of the week after Friday's practice. Mack (ankle) was not spotted at Thursday's practice, George Bremer of The Anderson Herald Bulletin reports. Analysis: Mack's non-participation is notable after he logged a limited practice session Wednesday. We'll have to see if his absence is precautionary, or indicative of a setback that could affect his availability for Sunday's game against the Raiders. 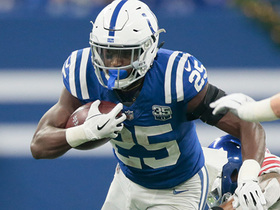 With Robert Turbin dealing with a shoulder injury, Nyheim Hines and Jordan Wilkins are currently the Colts' healthiest options at running back. Mack was a limited participant at Wednesday's practice due to an ankle injury. Analysis: Mack previously dealt with a hamstring injury, so the ankle issue is something new. His status will be updated based on his level of practice participation the next two days, but assuming he's able to play Sunday against the Raiders, Mack looks like a solid Week 8 lineup option. He cemented his role as the Colts' top back in the Week 7 triumph over the Bills, carrying 19 times for 126 yards and a score and catching two passes for 33 yards and another touchdown. Mack rushed for 126 yards and a touchdown on 19 carries while catching two of three targets for 33 yards and a touchdown in Sunday's 37-5 win over Buffalo. He was also successful on a two-point conversion on the ground. Mack ran for 89 yards on 12 carries and had a four-yard catch during Sunday's 42-34 loss to the Jets. Analysis: The 93 total yards tied a career high for Mack, who was playing his first offensive snaps since Week 2. Trailing by multiple scores early certainly didn't help the Colts stick with the run, but -- provided he's healthy -- Mack looks to be the bell cow in an Indianapolis backfield that struggled mightily in his absence. A Bills defense giving up just 3.8 yards per carry provides a tough next test Sunday. Mack (hamstring) is expected to start Sunday's road game against the Jets, Zak Keefer of The Indianapolis Star reports. Analysis: The Colts' ground game has failed to launch this season, ranking 29th in the NFL at just 74.4 yards per game. This reality has forced Andrew Luck to the air a league-high 245 times. With Mack in the fold, though, perhaps the offense will display a modicum of balance. Mack hasn't exactly proved effective in 15 career games -- he boasts 3.8 YPC and has hauled in 22 of 35 passes -- but he should pass Nyheim Hines and Jordan Wilkins as the No. 1 running back Sunday. Mack (hamstring) practiced fully Wednesday. Analysis: Mack was ruled out last week after practicing in a limited fashion, so his return to a full session Wednesday is a big step that points toward him suiting up Sunday against the Jets, barring any setbacks. If he's able to return to action in Week 6, Mack would represent little more than a speculative fantasy play, however, given that he would likely share backfield work with Nyheim Hines and Jordan Wilkins. Mack (hamstring) was on the field for Monday's light workout, Zak Keefer of The Indianapolis Star reports. Analysis: Mack's participation shouldn't come as a surprise after he logged limited practices throughout last week before being ruled out for Thursday's eventual 38-24 loss to the Patriots. A return to full participation at some point in the coming days would put him on track to return for a Week 6 road game against the Jets. Mack doesn't offer much upside as part of a committee in a pass-heavy offense, but he might breathe some life into the pathetic Indianapolis running game. Mack (hamstring) won't play Thursday against the Patriots, Scott Horner of The Indianapolis Star reports. Analysis: Mack was unable to upgrade from limited practice participation on the the short week, so he'll be sidelined for a third straight contest. While Mack has been out, Jordan Wilkins and Nyheim Hines have handled most of the reps at running back, but both could see their snap counts threatened with Robert Turbin returning from a four-game suspension. Mack (hamstring) was a limited participant in Tuesday's practice. Analysis: Mack was also listed as limited in practice last week and on the Colts' estimated injury report Monday. The second-year running back remains a question mark for Thursday night's visit to New England. If Mack is sidelined for his third consecutive game, expect Nyheim Hines to once again lead the Colts' backfield and split carries with fellow rookie Jordan Wilkins. Mack (hamstring) was listed as limited on Monday's estimated injury report. Analysis: As he was a week ago, Mack was limited, but the Colts didn't actually hold a formal practice session Monday. His hamstring continues to nag him, and with a short week to prepare for a Thursday night visit to New England, his availability remains up in the air. If he's absent for a fourth time in five games, the Colts will rely on Nyheim Hines and -- to a lesser extent -- Jordan Wilkins to fuel the ground game. Mack (hamstring) is inactive for Sunday's game against the Texans. Analysis: Mack's prospects of returning to action appeared promising after he logged a limited practice Wednesday, but his inability to advance to a full session by Friday may have closed the door on him suiting up Sunday. With Mack on the sideline for the third time in four games, Jordan Wilkins is expected to pick up the start at running back, though he'll likely share time with fellow rookie Nyheim Hines. Mack (hamstring), who is listed as questionable for Sunday's game against the Texans, isn't expected to play in the contest, Ian Rapoport of NFL Network reports. Mack (hamstring) is listed as questionable for Sunday's game against the Texans, Andrew Walker of the Colts' official site reports. Analysis: A limited practice participant all week, Mack continues to battle a hamstring injury that has lingered since the Colts' preseason opener on Aug. 9. Coach Frank Reich said Friday that Mack is "making progress" in his recovery, but a pregame workout seemingly will be the tipping point for active or inactive status Sunday. In the event he's unavailable again, Nyheim Hines and Jordan Wilkins will split reps out of the backfield. Mack (hamstring) took part in Friday's practice, George Bremer of The Anderson Herald Bulletin reports. Analysis: Mack was able to get on the practice field for the third straight day Friday, so he will have a chance to return to action after sitting out the Colts' Week 3 loss to the Bengals. The Colts will provide an official update on Mack's availability for Week 4 after Friday's practice concludes. Mack (hamstring) remained limited at practice Thursday, Andrew Walker of the Colts' official site reports. Mack (hamstring) returned to a limited practice Wednesday, Andrew Walker of the Colts' official site reports. Analysis: Mack was withheld from practice all of last week before sitting out Sunday's loss to the Eagles. As a result, Jordan Wilkins drew his second start of the season at running back in place of Mack, who also sat out the Colts' season opener. Now that he's back at practice, Mack is a candidate to re-enter the backfield mix this weekend against the Texans, though he would probably work in some form of a timeshare with Wilkins. Mack (foot/hamstring) has been ruled out for Sunday's game against the Eagles, Kevin Bowen of 1070 The Fan Indianapolis reports. Analysis: With Mack out this week, look for Jordan Wilkins to head the Colts' Week 3 backfield, with Nyheim Hines in line to work in a change-of-pace role. Mack (foot/hamstring) was not spotted at Friday's practice, Kevin Bowen of 1070 The Fan Indianapolis reports. Analysis: We'll await the Colts' official injury report for added details, but after not practicing Wednesday and Thursday, Mack's chances of playing Week 3 now appear cloudy at best based on his absence from the early portion of Friday's practice. Next up for carries if he misses Sunday's game against the Eagles are Jordan Wilkins and Nyheim Hines, in that order. Mack (foot/hamstring) was not present for Thursday's practice, Kevin Bowen of 1070 The Fan Indianapolis reports. Analysis: It remains to be seen if the Colts are simply managing the running back's reps, given that he's dealing with foot and hamstring issues, or if he's actually in any danger of missing Sunday's game against the Eagles. What Mack does (or doesn't do) at practice Friday will thus be telling with regard to his Week 3 status. Mack (foot/hamstring) didn't practice Wednesday, Andrew Walker of the Colts' official site reports. Mack (hamstring) rushed 10 times for 34 yards and caught one of two targets for two yards in Sunday's 21-9 win over the Redskins. Analysis: As if a running back platoon wasn't bad enough, the Colts appear content to torture fantasy owners with a three-headed committee at the position. Mack's 10 carries tied Jordan Wilkins for the team lead, but Wilkins gained 61 rushing yards to Mack's 34. Change-of-pace back Nyheim Hines also got four carries and vultured an eight-yard touchdown. Mack (hamstring) is active Sunday against the Redskins. The Colts are optimistic that Mack (hamstring), who is listed as questionable for Sunday's game against the Redskins, will suit up in Week 2, Ian Rapoport of NFL Network reports. Mack (hamstring) is listed as questionable for Sunday's game at Washington. Analysis: Belying the designation was Mack taking in a full practice Friday, his first of the campaign. As such, there's a good chance he'll make his season debut Week 2. Coach Frank Reich told Kevin Bowen of 1070 The Fan Indianapolis that he feels "confident for the game that if Marlon is up, ready to go, we will use him accordingly." Even if Mack suits up, though, the Colts likely will split RB touches between him, Jordan Wilkins and Nyheim Hines. Mack (hamstring) was listed as a limited practice participant Thursday. Analysis: That marks four straight limited sessions for Mack, but he's still not a lock to play Sunday against Washington. That said, his outlook on that front would brighten if he is able to log a full practice Friday. In Mack's Week 1 absence, Jordan Wilkins and Nyheim Hines effectively split the Colts' backfield duties, with Wilkins leading the way on the ground with 14 carries for 40 yards, while Hines made a mark in PPR formats by catching seven passes for 33 yards. Mack (hamstring) practiced again Thursday, Kevin Bowen of 1070 The Fan Indianapolis reports. Analysis: It remains to be seen, however, if Mack will once again be officially listed by the Colts as a limited participant, as he was Wednesday. While the running back is trending in the right direction, he's still not a lock to play Sunday against Washington. Mack (hamstring) was listed as a limited practice participant Wednesday. Analysis: Per Andrew Walker of the Colts' official site, Mack, who was held out of the Week 1 loss to the Bengals, was only inactive as a precaution. With three straight limited practices in a row under his belt, Mack is trending in the right direction for Sunday's game against Washington, but for now, coach Frank Reich calls the running back day-to-day. Mack's chances of suiting up in Week 2 would no doubt be boosted if he practices fully Thursday and/or Friday. Mack (hamstring) suited up for practice Wednesday, Kevin Bowen of 1070 The Fan Indianapolis reports. Analysis: With Mack out due to the injury, rookie Jordan Wilkins will be first in line to pick up the slack in the backfield. However, Christine Michael and Nyheim Hines could also figure into the mix as the division of touches isn't clear. Mack (hamstring), who is listed as questionable for Sunday's game against the Bengals, will go through a pregame workout before a call on his status is made for the season opener, Ian Rapoport of NFL Network reports. Analysis: Even if Mack's strained left hamstring doesn't prove too problematic in his workout, it appears he'll need to demonstrate significant improvement compared to earlier in the week, when he was a limited or non-participant in the Colts' three practices. If Mack is held out Sunday or faces a limited workload due to the injury, rookie Jordan Wilkins would be first in line to pick up the slack in the backfield. Mack (hamstring) is listed as questionable on the official injury report for Sunday's game against the Bengals. He was a limited participant in practice Thursday and Friday. Mack (hamstring) took part in Friday's practice, according to Andrew Walker of the Colts' official site. Analysis: There has been pessimism regarding Mack's Week 1 availability up to this point, but he was able to get some work in the Colts' last two practice sessions this week, so he will at least have a chance to play in the season opener. 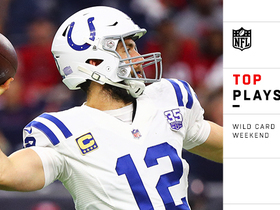 The Colts' final injury report of the week will reveal if the Colts make a final call Friday, or leave the door open for him to play Sunday. Though Mack (hamstring) was present for practice Thursday, Kevin Bowen of 1070 The Fan Indianapolis indicates that the running back's Week 1 status is cloudy. Analysis: Mack was officially listed as a limited practice participant Thursday. Given that it was the first time Mack has worked since Aug. 9 and that he's heavily reliant on his speed, it wouldn't surprise us to see the Colts ease him into the mix and either elect to hold him out, or limit him if he suits up Sunday against the Bengals. In both of those scenarios, Jordan Wilkins profiles as the front-runner to head the team's Week 1 backfield. Mack (hamstring) returned to practice Thursday, Zak Keefer of The Indianapolis Star reports. Analysis: Mack is practicing for the first time since hurting his hamstring in the first preseason game. He's likely a long shot to play this week, but track his progress in practice. Mack, who has been dealing with a hamstring issue since Aug. 9, is "trending in the wrong direction" as Sunday's season opener against the Bengals approaches, Kevin Bowen of 1070 The Fan Indianapolis reports. Analysis: Given that Mack is a player reliant on speed more so than power, it's expected the Colts will ease him into the mix once he's ready to practice, whenever that might be. If Mack is sidelined this weekend, Jordan Wilkins, Christine Michael and Nyheim Hines would serve as the team's backfield options in Week 1. Of that group, Wilkins would be the presumed starter. Mack (hamstring) won't practice Wednesday, Mike Chappell of Fox 59 News Indianapolis reports. Analysis: With Mack's status uncertain for Sunday's game against the Bengals, it looks like Jordan Wilkins and, to a lesser degree, Christine Michael, could end up handling the team's early down work. Meanwhile, Nyheim Hines will be on hand to serve in a change-of-pace role. Mack (hamstring) wasn't spotted at practice Monday, Zak Keefer of The Indianapolis Star reports. Analysis: This nugget does nothing to change the perception that Mack's status for Sunday's game against the Bengals might come down to the wire. If he's unable to go, Jordan Wilkins profiles as the frontrunner to start at running back in his place Week 1. Mack (hamstring) "might come down to the wire" for Week 1, according to Andrew Walker of the Colts' official site. Analysis: The running back suffered his hamstring injury back on Aug. 9 and though he's made "good progress," per coach Frank Reich, Mack's Week 1 availability is not considered a slam dunk. In the event that he isn't ready for the Colts' Sept. 9 contest against the Bengals, Jordan Wilkins profiles as the frontrunner to start in his place. Coach Frank Reich noted Tuesday that Mack (hamstring) has made good progress over the last two days, Greg Rakestraw of Colts Radio Network reports. Analysis: Mack has been sidelined since injuring his hamstring Aug. 9, so this nugget, however vague, represents a positive indicator as Week 1 approaches. It can be assumed that Mack won't play in Thursday's preseason finale against the Bengals, but his regular-season outlook would brighten in a hurry if he's able to return to practice in short order. Per Mike Wells of ESPN.com, Jordan Wilkins "is the frontrunner to start" if Mack isn't ready for the Colts' Sept. 9 contest against the Bengals. Mack (hamstring) may not be healthy by Week 1, Mike Chappell of Fox 59 News Indianapolis reports. Analysis: Mack continues to nurse a strained hamstring stemming from the Colts' preseason opener Aug. 9. Reading between the lines, coach Frank Reich suggested Thursday that Mack must practice next week in order to set himself up for active status Sept. 9 against the Bengals. Thursday also marked the return of Robert Turbin (ankle, suspension) to drills, allowing him to join Jordan Wilkins, Christine Michael and Nyheim Hines in the competition for backfield snaps. Mack (hamstring) isn't practicing Wednesday, Zak Keefer of The Indianapolis Star reports. Mack is expected to miss a few weeks due to a hamstring strain, Jason La Canfora of CBS Sports reports. Analysis: Mack limped off the field during Thursday's exhibition at Seattle, but the injury isn't considered to be serious. With the Colts' expected No. 1 back out of commission, Jordan Wilkins, Nyheim Hines and Robert Turbin (suspension) will work with the first-team offense for the rest of the preseason. Mack left Thursday's preseason game against Seattle with a hamstring injury, Mike Chappell of Fox 59 News Indianapolis reports. Analysis: Mack limped off the field grabbing the back of his leg during the first quarter, so it looks like it could be more than a minor ailment. Colts owner Jim Irsay said Mack could be a star in the Indianapolis offense this season. "Depends on how many times you want to feed him the ball,16-20 touches on the ground (a game) and I could see him approaching 1,500 yards (for the season). I really could," Irsay told the Indianapolis Star. "He is just better than you think he is every time you watch him." Analysis: Take this with a grain of salt, as Irsay has been prone to having a rosy outlook for his team and players. However, his praise of Mack may be reflected in the coaching staff's opinion of his talent. While there's been talk of a committee approach at running back with both Jordan Wilkins and Nyheim Hines likely figuring into the mix, Mack could command a greater share of touches with some early success this season. Mack has been the first running back to take reps with the starting offense at training camp practices, Kevin Bowen of 1070 The Fan reports. General manager Chris Ballard indicated Friday that Mack (shoulder) has received full medical clearance, and the running back will be ready for the start of training camp, Zak Keefer of the Indianapolis Star reports. Mack (shoulder) didn't participate in June minicamp, Andrew Walker of the Colts' official website reports. Colts general manger Chris Ballard revealed Tuesday that Mack played through a torn labrum in his shoulder as a rookie and underwent surgery during the offseason, Alex Marvez of SiriusXM NFL Radio reports. While Mack would appear to be the clear starter at running back after the Colts failed to select a running back early in the draft, head coach Frank Reich said he's open to utilizing multiple backs, the Indianapolis Star reports. "I'm very comfortable with the running back-by-committee," said Reich. "I'm very comfortable with (competition)." Analysis: Indianapolis selected two running backs in the draft with Nyhelm Hines taken in the fourth round and Jordan Wilkins taken in the fifth round. Mack should be the clear leader for the starting job and Indy's lack of signing a veteran free agent or spending a high draft pick on a running back is good news for his fantasy value and we may not want to read too much into Reich's statement. Still, Mack will need to prove he can be the starter and get the bulk of playing time in training camp. Mack is trying to gain a little bit of weight to prepare for the possibility of an increased role in his second NFL season, Andrew Walker of the Colts' official website reports. Mack had seven carries for 28 yards, including a one-yard touchdown, in Sunday's win over Houston. Analysis: The Colts stuck with Frank Gore as the primary ball carrier all season even though at age 34 he's unlikely to return next season and Mack could be the future starter. Mack had 358 yards rushing and four total touchdowns in his rookie season. He had just a 3.8 YPC, but showed explosiveness and could be poised to become the starter if Gore doesn't return. Mack had four carries for 17 yards and two receptions for 37 yards on two targets in Saturday's loss at Baltimore. Analysis: The Colts never decreased starter Frank Gore's workload to give Mack an extended look in an effort to evaluate him for 2018. It's possible Mack could be featured more in the team's final game next week against Houston, but we wouldn't count on it. Mack carried six times for 14 yards and failed to bring in his only target in Thursday's 25-13 loss to the Broncos. Mack carried seven times for 23 yards and caught two of three targets for an additional 21 yards during Sunday's 13-7 loss to the Bills. Mack had six carries for 46 yards and one reception for eight yards in Sunday's 30-10 loss at Jacksonville. Analysis: Mack played 30 snaps on offense, which was more than starter Frank Gore's 22 snaps as he got playing time late amid a blowout loss. Although Gore is still getting the bulk of carries, it's possible Mack could see more work in the final few games of the season as the team looks toward 2018. Mack had four carries for 11 yards and two receptions for 20 yards, but was part of a key fumble near his own end zone in Sunday's loss to Tennessee. Quarterback Jacoby Brissett was charged with the fumble on a pitch, but Mack had it in his hands and dropped the ball. Analysis: Mack played just 19 snaps and didn't get a target or carry after his key third-quarter fumble. It's possible he may lose playing time next week due to the fumble, but the Colts would be better served to give him experience ahead of 2018. Besides, Mack hasn't had previous issues with ball security. Mack had seven carries for seven yards and two receptions for 19 yards on four targets in Sunday's loss to Pittsburgh. Analysis: Mack played 25 snaps on offense compared to Frank Gore's 34 snaps. Mack will likely see more playing time later in the season as the Colts look toward 2018, but he'll have a prominent yet secondary role in the meantime. Mack offers big-play ability, but his upside is limited by Indy's overall struggles on offense. Mack rushed nine times for 29 yards and wasn't targeted in the passing game during Sunday's 20-14 win over the Texans. Analysis: Mack was out-touched 20-9 by Frank Gore. 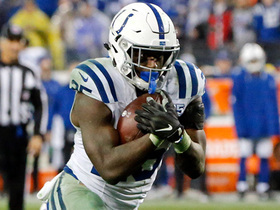 Indianapolis' offense struggles to create scoring opportunities and Mack continues to serve as little more than a change-of-pace option behind Gore, so the rookie fourth-rounder still offers minimal value in standard formats. 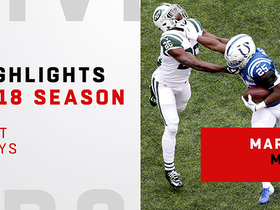 Watch Indianapolis Colts running back Marlon Mack's best plays from his 2018 season. 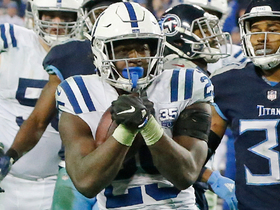 NFL Network's LaDainian Tomlinson breaks down how running back Marlon Mack was the difference maker for the Indianapolis Colts' offense in their win over the Tennessee Titans in Week 17. 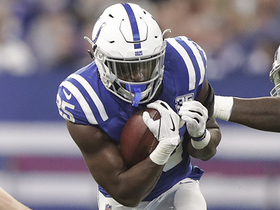 Indianapolis Colts running back Marlon Mack goes untouched for 8-yard touchdown. 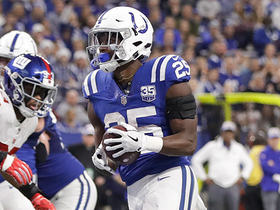 NFL Network's Brian Billick breaks down why Indianapolis Colts running back Marlon Mack's impact goes far beyond the stat sheet. Indianapolis Colts running back Marlon Mack follows his blocks for a goal-line touchdown. 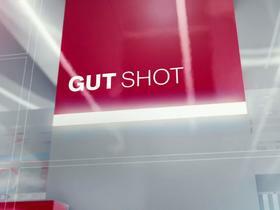 NFL Network's Reggie Bush reveals what the Indianapolis Colts need to do to avoid a letdown against the New York Giants in Week 16. NFL Network's "NFL Fantasy Live" crew re-examines fantasy moves that should have been made in Week 15.